When Jerry and the gang sat down to watch TV on Seinfeld (a tricky proposition, as that couch could never sit all four of the main cast), we all knew there was a wall behind the unseen television set, correct? Here's something that makes us redefine the phrase "television set" altogether, and it's just one of a series. Behold, the plans for Jerry's modest but well-used Upper West Side apartment from Seinfeld. You can tour his portfolio here. One of his popular pieces is a creation of the neighbouring apartments on Friends, which fuels the debate on how, exactly, Monica and Rachel were able to afford a spread like that in the West Village on the salaries of a starting (and sometimes unemployed) cook and a coffee shop employee. Ah, television! There are more sets and collections here; I bet you'll get a kick out of the ways that designers tap into what you're already familiar with as they try to see you an unseen movie. This is a student project that would appear to be about packaging milk as wine, but it's really not about milk, but rather Milk, as in Harvey Milk. There are reasons for the subtle design choices you see above. You can read about it here. This is a keen way of thinking about luck, and especially the lucky. A variation of this saying has been attributed many times to Samuel Goldwyn, the film producer. It was produced by Studio Muti. We had an interesting experience yesterday on Fifth Avenue as we were walking to the Metropolitan Museum of Art. The stretch of "museum mile" near Central Park not only connects several museums but is notably home to a variety of street vendors who will gladly sell you cheap reproductions of famous paintings, photographs and magazine covers. We saw one vendor who sold a variety of parodies of the "Hope" poster featuring Barack Obama. Some were funny, so I took my phone to take a snap. The vendor got aggressive. "Hey, hey, hey! This is my work!" he yelled at us, protecting his $5 products with his arms. Now, of course, I found this instantly ironic. I pointed to the reproduction of the "original" Hope design, the one made by Shepard Fairey during the 2008 U.S. election campaign. "You made this? You actually own the copyright and trademark on this image?" I asked. Well, that made him a little, um, upset. "Get outta here!!" he screamed. We left, and couldn't help but laugh. Let's review the case: the fellow was not only appropriating the design of someone else (and, as someone reminded me later, Fairey himself ran into trouble because he used a copyrighted photograph owned by someone else), but a host of copyrights, including the owners of characters such as Homer Simpson and Peter Griffin. Moreover, it's not like the fellow had come up with something remotely original. Parodies of the Hope design are rampant, and you you can easily make one yourself on the internet, right here for instance. The lesson for our son, apart from those involving intellectual property and fair use, moreso pointed to a particular type of vendor: the raging idiot. It's been curious watching the faux-vintage theme run its course, with modern products, ideas and persons given a retro-minded makeover in the style of, say, advertising from the 30s or propaganda posters from the Second World War. The above is one of the originals, and part of this gallery. Guess which section of the bookstore this is? 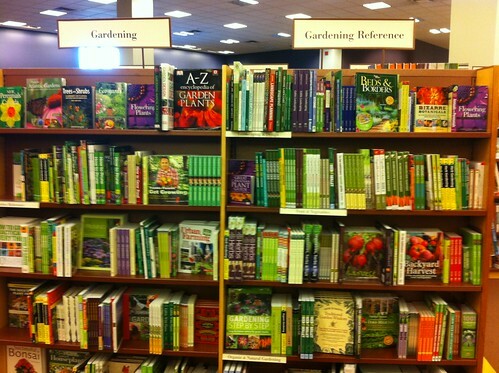 OK, the section headers on top do give it away, but have you ever noticed just how many gardening books have green covers and/or spines? Altogether, they kind of blur together, and I found myself drawn to the books that didn't have green plastered all over. From Minimalist Movie Posters, another way of thinking about the first Indiana Jones adventure. As I get older, I find myself more and more interested in architecture. Not in an entirely serious way; websites and blogs about buildings and their design are often just something I like to look at while I'm eating toast. The thing is, to get into the viral stream of things, there often has to be something eye-popping, which means you're often presented with the unusual or exotic or improbable. This is from a post on Architecture Linked of what's called Sky Garden House, designed by a firm in Singapore. The hook for the post is how the design makes use of natural elements and incorporates grass, shrubs and living things into the overall package. After you click on this link, you'll see that the look of the house really depends on the angle where the picture is taken. What's inside is pretty cool: check out the staircases here. The thing, of course, is that it's not a lighter at all, but a USB. It's part of this collection of curious USB designs. I'm not surprised to see that the walls at the offices of Twitter happen to look a bit like one of Twitter's best-known visual themes. The pic is part of a collection of interesting workspaces, and I have to say that Twitter's home base is among the more mundane. If you need pi to tell time, this is the clock for you. As seen here. I saw this here, and it made me think about hotel faucets in particular: why is much of the range so uncomfortable? Instead of traditional instruments and warning lights, the BMW of the future will display key information in a three dimensional head-up display in the direct sight line of the driver, eliminating the need for his eyes to re-focus on dials inside the cabin. Check out more in the Telegraph. Martha and I have been keeping an eye out for a decent floor lamp, for the living room. We have some lamps, for sure, but in one key spot we don't really want to have to use critical space with an end table whose main purpose would be to hold said lamp. A floor lamp would give us the light we need, without making much of a footprint. The problem? The kinds we like are bloody expensive. Here's a case example. I landed on Danskdesign, which sells very nice European furniture and household products. The portfolio of floor lamps had lots of possibilities ... until I converted the currency to U.S. currency and saw that the economy models sell for about $700. Oh well. Back to keeping an eye out for that elusive stylish bargoon. When I started buying my own books in the Seventies, a lot of what I was picking up were used copies of paperbacks that had been published in the Sixties (it makes sense; I was a kid trying to stretch the book-buying power of my paper route income). Thus, the style of this set of purported mid-Sixties novelizations of movies that had not yet been made was familiar, and the humour is spot-on. Colour mixing humour, as it were. From the archives of Myapokalips. This summer, the theme is "fast lane," and a series of videos like the one below. As with the stairs, the brand - let alone the product - is practically immaterial. Which, I assume, is the point of how the branding in this campaign works. A few weeks ago, I parted with £75 (or about Cdn $120, I think) for a subscription to Monocle, the British-based magazine that comes out about 10 times a year. It costs about as much to buy it here in St. John's, but I figure this way I'll get in closer to when it comes out. It's an unusual magazine, that covers industries as diverse as retail fashion and defence contracting, and while parts of it leave me cold, I find myself reading it deeply for an hour or so at a time. Usually, the attraction of getting a subscription is that you can get a bargoon, often a small fraction of newsstand price. This is all well and good, but there's been a brutal worldwide recession, and Monocle - which depends on advertising from the luxury brands it often covers - would seem to be in trouble, like practically every other magazine. Here's a bit from a recent piece in Bloomberg's BusinessWeek about the magazine and its Canadian-born founder and editor-in-chief, TylerBrûlé, he of the extra accents (his father didn't use either of the accents in Brule). The latest edition of Monocle is a fat book of a magazine that challenges just about every piece of received wisdom about what works in media these days, starting with the notion that this is no time to start a new print publication. Now three years old, Monocle boasts a global circulation nearing 150,000, a 35 percent annual increase at a time when magazine sales are supposed to be going in the other direction, and a rising subscription base of 16,000. If that sounds small, consider that these individuals pay $150 for 10 issues, a 50 percent premium over the newsstand price. Monocle has launched an interesting spinoff this summer: a newspaper, another product known for its declining and thinning ranks worldwide. There's only one edition, and it's being marketed at the Mediterranean summer crowd, or, as likely, those who wish they were among that number. I haven't seen or felt, the issue, and I use the word "felt" because Monocle decided to use a type of paper stock that is far more pliable and longlasting than conventional newsprint. It's also, by necessity, more expensive. There you have it: the newspaper as luxury good. I happen to think there's some logic in that concept, incidentally, for all newspapers, even though I would propose a different tact that what Monocle is doing this summer. Rather than trying, often in vain, to herd in would-be readers that will never buy the product, or produce giveaway products that simply go straight to recycling (if that), publishers should consider tailoring their product to the audience that will stick with the published word and will pay what's required for it. Anyway, I'll be going back to my latest Monocle later today, to pick up where I left off on a thought-provoking piece on making cities more human-sized and inviting. I don't like everything in and about Monocle, and I stick by a column I wrote last fall on Brûlé's foolish thinking on social media, but for what I'm paying for it - and for book-quality pieces on such a wide range of issues - it's a good deal indeed. This one was seen here. Helvetica was created in the 1950s, and although it took a while to go mainstream, it's a go-to font for that retro feeling. Sometimes, a bit too easily, as this bit of comic advice suggests. The slide has been making the rounds on design blogs; I found it here. I love this. Especially the option for those who really don't want to be happy, thanks. As seen here. I saw this just now on BoingBoing: an awesome bit of design and construction, all meant to fool the eye. We have a mixed bag this week, starting with a local photo blog that is not updated often, but which is deserving of your attention. Later on, we’ll revisit some childhood memories, turn YouTube videos into MP3s, and eavesdrop on some healthy venting from designers and journalists. Sporadically updated as it is, this set of photographs is really something. Robert Young, every now and again, adds a picture and some comments to a set of images of folks who make St. John’s what it is. In February, he marked the passing of Bill (“Moon Man”) Sweeney; at other times, he’s added images of folks you see around the city. I wish Robert would add more … and maybe pursue a more ambitious project. The idea is that good. Surely you have a picture of yourself as a child that captures all the exuberance or awkwardness or poignancy or innocence (or, just maybe, all of these things at once) of your younger self. Ze Frank, who has had some great online success with off-the-wall ideas, has a wonderful feature called Young Me Now Me, in which participants take a photo of themselves, more or less matching the pose of a childhood snap. Some are spot on, some don’t seem at all similar, and a few might take your breath away. Ever seen, say, a concert performance on YouTube that you liked so much, you wanted to listen to it later on your iPod? Dirpy is the tool for you. It converts a YouTube video to an MP3, suitable for loading up on the player of your choice. A caveat: you may well be cheating a copyright law or two here. Another caveat: remember that the audio quality in many YouTube videos is, well, hideous. This site has been making the rounds lately among some self-employed folks and creative types I know, and they’ve been laughing – often out loud – with recognition. The idea is that professionals (designers, web developers, writers) send in horror stories of working with clients who just don’t get it. Take the designer who informed the client that the small, out-of-focus pic supplied simply would not work for a professional campaign, and was told the client was disappointed in their skills. Even outsiders will find this funny … and perhaps a few clients would benefit from reading the tales, too. In a similar vein, but closer to my profession, Overheard in the Newsroom publishes anonymously submitted tidbits, almost always verbatim exchanges that make you laugh or cringe, or both. An example: “Editor: ‘Kiddo, you can’t pitch stories like you’re already in love with them.’ Intern: 'Sorry. I forgot that enthusiasm is a no-go in this place.' "
Yes, Scott Adams had hit the nail on the head a thousand times or more, as chronicles the petty insults and idiocies of contemporary office life … but couldn’t you (yes, you, with all of your wit and pain and woe) do a better job? That is, sort of, the point behind Dilbert Mashups, in which the official site asks readers to take an existing strip, and put their own personal spin on it. From The Oatmeal, a tipsheet on good grammar (e.g., how to know the difference between They’re, Their and There) that is also great to look at. Feel free to share with your friend and colleagues; after all, they may better accept spelling advice when it comes with a smile attached.